So I was perusing the Internet the other day and ran across the picture below as part of PDF file that was created for Project 1320. See that site here. They are doing some cool stuff. The driver number is 358. WG’s number was 358. 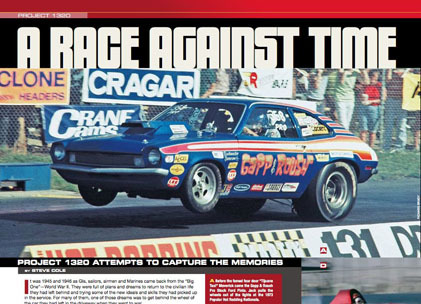 Here is a bit of information about the NHRA Driver numbers that Gapp and Roush used. In general from 1971 to 1975 they used ‘356’ on the car when not using ‘1’ or ’51’. 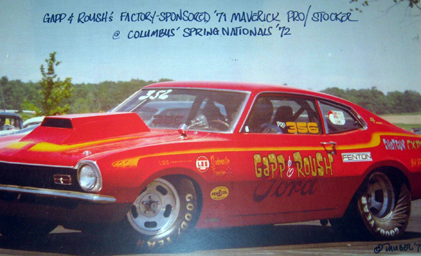 If they were running two events before 1975 they each used their own number ‘356’ for Roush and ‘358’ for Gapp. After 1975 I haven’t seen a car that carried ‘356’…only ‘358’ or Dondero’s which I think was ‘1006’. That’s because the two were operating as separate businesses and there was no need for Roush’s number.